YouTube Channel Main Video Upload Karne Se Pehle Video Main Best Editing Kare. Agar Funny Video Hain Toh Funny Sticker, music Add Kare, Editing Ke Liye Best Application Ka Use Kare, ex : Viva video, Video Maker, Kine Master, Inshot etc Bahot Sari Editing Application Play Store Se Free Install Kar Sakte. Agar Aap Screen Recoding Karna Chate Hain To "Mobizen" Ya "Az Screen Recoder" Ka Use Kare. Video Editing karne Se Dekhke Wale Pe Jyada Effect Hoga Or Woh Video Dekhna Pasand Karega. YouTube Pe Video 10 minutes Se Bada banaye. SEO Pe Yeah Jyada Effect Karta Hain Kyo Ki YouTube Top Pe Usi Video Ko Dikhata Hain Jis Ka watching time Jyada Ho isi Liye Agar Video Bada or Accha Hoga To watching Time Jyada Rahega Or Ads Bhi Jyada Show Hoge Jise Aapki Earning Bhi Increase Hogi.!! 10 minutes Se Kam Video Hain Fir Bhi Top Pe Aa Sakta Hain Par Video Jitna Long, Interested , Ho Utna Accha Hain ..!! Yeah Topic SEO Main Itna Jyada Effect Nai Karta Par Adsense Or Earning Pe Jyada Effect Karta Hai!! Video Ka Tital Bahut Important Hain, Video Tital Main Best Keywords Use Kare, Kyoki koi User YouTube Pe Kuch Bhi Search Karega Tab Aapke Video Main wo Keyword Hoge Jo User Ne Search Kiye Hain Toh Aapki Video Uske Samne Show Hogi. Is Liye Tital Main Popular, Jyada Search Hone wale, Post Related Keyword Use Kare. Tital Aisa Rakhe Jise User Ko Pura Clear Ho Jaye Ki Video Topic Hain, Or Us Main Kya Hain. Tital Long, Interested, Best Banaye. Video Main Tital Ke Baad Description Aata Hain. Description Aapko Video Ke Topic Or Related Sare Keyword Ko Use Karke Likhna Hain, Description Bhi Traffic/views Lane Main Bahot Helping Hain, Description Main Video Ke Related Ya Apni Site, Other video, YouTube Channel etc Ki 2 ya 3 Link Dale. Link Or Big Description Ki Wajah Se Video Google Main Bhi Show Hote Hain! Description 100 to 200 words Main Likhe. Tital Or Description Ke Baad Tags Ka Optain Aata Hain. Yaha Video Or Tital Ke Related Keyword Use Karke Tag Daalne Hote Hain Tags SEO Ke Liye Bahut Important Hain !! YouTube Main Koi bhi video Opan Karne Par Uske Saath Bahut Sare video Side Main(Related video,Suggested Video) Show Hote Hain, Tags Hamare Video Ko Other Video Ke Saath Suggestions List Main Show Karta Hain Jise Hamare Video Pe Fast Or Jyada Views Aate Hain. Ex: Agar Apke Koi video Ka Tital Hain " How To Use 4 WhatsApp in 1 Mobail ??" Or Us Main Apne Tags Main " Run 4 WhatsApp in 1 Mobail" Dala Hain Toh Agar Koi YouTube Pe Search Karta Hain " Run 4 WhatsApp in 1 Mobail" Tab Use Yeah Tital wale Video Dikhenge Or Yeah Aapke Video Ka 1 Tags Hain Is Liye Aapki Video Bhi Us List ( Related Video) main Show Hogi !! Video Ke Tital, Description, Tags Ke Baad 1 Important Point Hain Video Ka Thumbnails, Simple Language Main Video Ka Profile Picture ! Apne Video Main Best Editing Kiya Hua Thumbnails Lagye Kyo Ki Jyada user's Tital Se Jyada Video Ka Thumbnails (Photo) Dekhte Hain Koi Mast, Impressive, Effected Thumbnails Dekhke User Directly Video Pe Click Karta Hain Is Liye Yeah Important Hain. YouTube Main 80% + User's Tital Padhne Se Pehle Thumbnails Dekhte Hain !!! YouTube Video Publish Karne Ke Baad Views Ke Liye Sharing First Step Rahta Hain, Or New YouTuber's Ke Liye Sharing Bahut Important Hain, Video Publish Karne Ke Baad Use Facebook, Whatsapp, Twitter, Gmail, Yahoo, Skype Etc Bahut Sari Social Site Pe Share Kare, Agar Aapki Koi Site Hain Toh Us Pe Bhi video Share Kar Sakte. Sharing Bahut Easy way Hain Jise video Pe Views Increase Kar Sakte Hain!! Video Updating Matlb Channel Pe Old Video Ko Update Karna, Aapke Channel Par Kahi video old Hone Ke Baad Us Pe Views Nai Aate Toh Aise video Ko Update Kare, Old Video Ka Tital, Description, Tags, Thumbnails Chang Kare, YouTube pe Jo tital Most Popular, Topper Related (Apne Video Se Related) Tital Hain wo Select Kare Ya Tags Main Add Kare, Description Main Latest Video, Site etc Ki Link Add Kare, YouTube pe Thumbnails Chang Kare Jise User's Ko Old Video Bhi New Or Latest Lagta Hain !! Is Video Updating Ke Baad Sharing Kare, Video Updating Se 100% Views Increase Hote Hain Is Tarrah Video Updating SEO Ke Liye Important Hain. !! Help Karne Ki Puri Try Karunga !!! 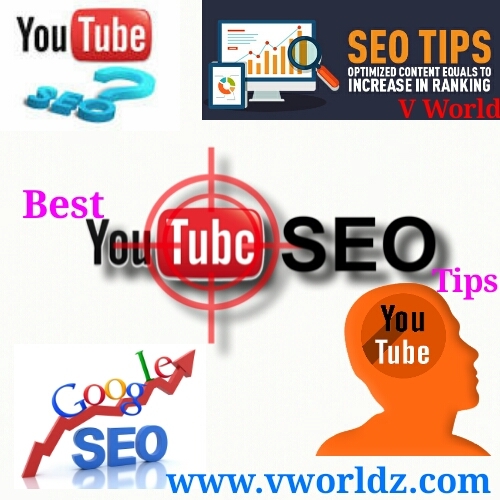 0 Response to "SEO: Search engine optimization Best Tips For YouTube"